You shouldn’t believe everything your grandmothers tells you, is something my mother once said. I had two grandmothers and only one who really practiced storytelling. One of those stories was about her African great-grandmother, born unfree on the sugar plantation Paradise in Surinam, who lived in a wing of a house on Java, Indonesia, amidst an increasing number of swallow nests. She refused to have those nests removed, something my grandmother attributed to some sort of superstition and might well have had its source in stories about swallows connected to pilgrims in the valley of Baca in the Bible or the defence by swallows of Mecca against elephant attack in the Quran. So much for one grandmother and one story. Victor Ehikhamenor grew up with seven grandmothers and was influenced by their oral storytelling. So I read in the book A Biography of the Forgotten about the artwork of the same name, which visitors can pick up in the Nigerian Pavilion. You actually enter the pavilion into the artwork that covers all walls and the ceiling of the entrance hall, with a continuous writing-like line on cloth with interloping real mirrors and bronze statuettes, which were fixed to the cloth and refer to the ancient bronzes of Benin, early European trade commodities and a bit of self-reflection. From bronze to mirror, mirror to bronze. Do we create in our own image or do we follow what is created for us in the image of others. Ehikhamenor receives his audience in Venice with a question and near physically unites us with a line that runs and turns for ever and which we can only see, but was for him more about doing it and using his hands. ‘It’s almost like praying,’ he told one of the writers of the collected texts in the book: Toni Kan, Emmanuel Iduma and Liz Bolshaw. I wondered. Why is the work not here as a ‘Prayer Room,’ the title given to a very similar space inspired by a traditional hall where community elders in the region of Esan meet for decision making. ‘That work should not be mistaken for a shrine,’ is what Ehikhamenor says about it somewhere. In Venice too, the work was not installed completely without worries from religious men. 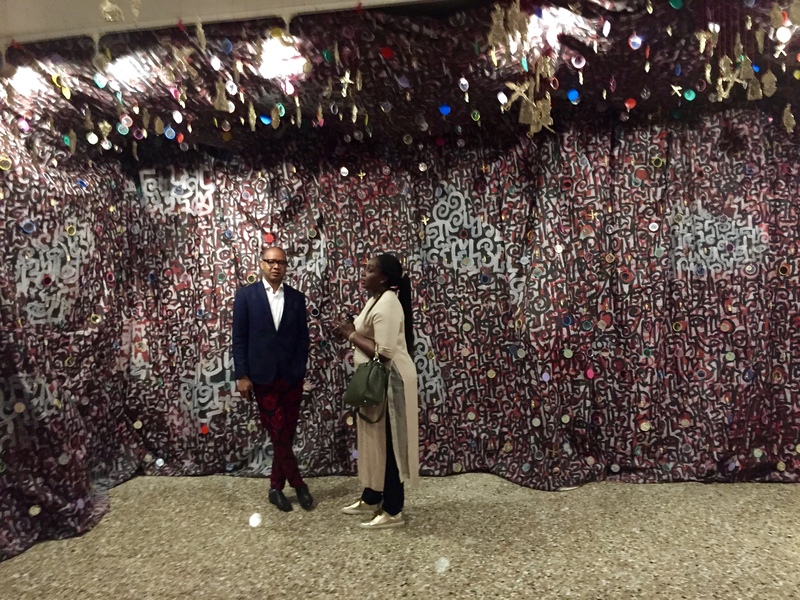 Being interviewed by Yinka Elujoba for the pavilion’s hand-out, the artist shares that the person in charge of the Venice space saw ‘something different’ in his work and equated it with paganism. ‘The Biography of the Forgotten’ is however an energetic expression of love, a love which the artist seems to have developed at an early age, for the anonymous artists of the past who cast and sculptured, conceived and recited the very core of one of many Nigerian cultures that resisted being erased in a confrontation with global narratives being broadcast from elsewhere. Most people visiting the pavilion will have heard of the country Nigeria, but not necessarily of the Esan region or ethnicity or of Edo State. Neither had I. And though Wikipedia does have pages about them, excelling in long lists of important people who originate from there, I somehow started longing for an average Nigerian to pick up a camera and upload us some pictures. Of the village of Uwessan perhaps.